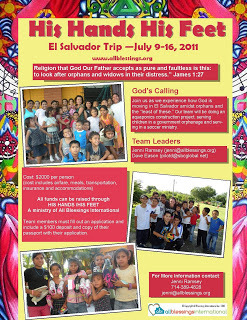 We are now accepting applications for the El Salvador trip! The team will have two main focus areas - visiting orphans and construction. We will also be participating in a soccer tournament and are collecting soccer balls and cones to take with us. If you would like donate soccer items, children's shoes, or other items for the orphanage, please contact Jenni @ jenni@allblessings.org.